So sings Aaron Neville at the beginning of this collection of inspiring Gospel tunes that testify to the courage and resilience of the people of his native New Orleans – and all of us – as we face the storms of life with faith and hope. He blends gospel with a bit of gumbo and his angel-like voice to inspire – keep on, keeping on, even when times are tough, trust and let God use you “anywhere, anytime.” My favorite songs, #8- “Tell Me What Kind of Man Jesus Is” and #9- “I Want To Live So God Can Use Me,” are awesome southern Gospel at its best. Listening to the whole CD, however, is like attending a church service with segments of praise, testimony, teaching, reflection, prayer and…joyous worship! Aaron Neville is not only one of the most amazingly gifted singers out there with his truly unique voice, he is also a devout man of faith who has weathered many storms in his life (drug addiction, poverty, loss…) From his inspiring example and music, you can tell “the purity of prayer is never far from his lips, the power of music never far from his heart,” as stated by Monica A. Coates in the CD intro. 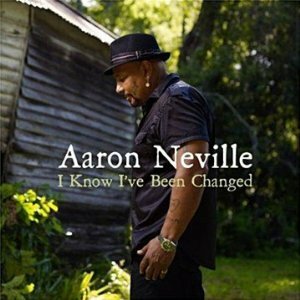 Celebrating his his 50th year recording music, Aaron Neville keeps the Gospel joy coming in “I Know I’ve Been Changed.” Give it a listen, but be careful – you might get inspired to do some changing. This entry was posted in Music and tagged gospel music. Bookmark the permalink. Va., I’m so glad you introduced us to his music years ago–we’re big fans and have been blessed, not only by his tremendous talent, but by his great spirit! — c.
Cindy – thank YOU for the tremendous blessing you have been for so many, many, many years – and for your great spirit that has touched me in so many, many, many ways!!! !